«What are those mini cameras doing in that advertising column!», a Twitter user asked today. In a response, Dutch Railways (NS) said that advertisers use the cameras to assess whether passengers look at advertising and for how long. A spokesperson of Exterion, the owner of the advertising columns, told Dutch broadcaster NOS that as many as 35 such cameras are already observing passengers at Amsterdam Central Station. Reportedly, the cameras can determine the gender of people and estimate their age. In the future, facial recognition and emotion detection may be added, but that hasn’t been decided yet. Exterion assures that images will never be stored, but doesn’t make that claim about (personal) data gleaned from the images. They told another broadcaster, RTLZ, the cameras only register «‘ones and zeros’, for example whether someone is male or female, so no sensitive data from a privacy perspective». Such a statement may not be the best way to convince people you take privacy seriously. A spokesperson of the Dutch Privacy Authority told NOS that they will investigate the matter, but «in general, cameras in public spaces may not be used for advertising purposes». The party leader of the Green Party in Amsterdam, Rutger Groot Wassink, has called for direct action: «Who will join me tomorrow in taping up these bloody things». UPDATE 11 September 2017 - According to media reports, Exterion has announced it will temporarily turn off the 35 cameras in advertising columns at Amsterdam Central Station, because of «the commotion» they caused. They ascribe the commotion to insufficient communication, which suggests they see nothing wrong in the cameras as such and may turn them back on in the future. Members of Parliament have asked questions about the cameras (SP, D66). Scraping LinkedIn profiles could be legal. Is that creepy? An interesting American court ruling discusses whether the company hiQ Labs may legally scrape public LinkedIn profiles and sell analyses based on that information. LinkedIn tries to portray this as an attack to its efforts to protect the privacy of its users. Some media seem to buy this line: Having a public profile just got more risky (the Independent); Is your boss checking up on you? Court rules software IS allowed to look for changes to your LinkedIn profile that suggest you’re quitting your job (Daily Mail). LinkedIn’s professed privacy concerns are somewhat undermined by the fact that LinkedIn allows other third-parties to access user data without its members’ knowledge or consent. LinkedIn specifically refered to users who use the don’t broadcast feature, which prevents the site from notifying other users when these users make profile changes. hiQ could be violating these users’ privacy by informing their employers about profile changes, which may be an indication that they’re looking for another job. There’s more to the case than just the privacy issue. For example, can a website owner prohibit the automated retrievel of otherwise public information? Can they sanction specific users for even looking at their website («effectuating the digital equivalence of Medusa»)? And is it ok for LinkedIn to use it’s dominant position in the professional networking market to stifle competition in a different market? It will be interesting to see how this develops. Read more about Scraping LinkedIn profiles could be legal. Is that creepy? A couple years ago, Apple obtained a patent for an intriguing idea: create a fake döppelganger that shares some characteristics with you, say birth date and hair colour, but with other interests - say basket weaving. A cloning service would visit and interact with websites in your name, messing up the profile companies like Google and Facebook are keeping of you. a free browser plugin that runs in the background on Jane’s computer (or yours!) and creates real-but-meaningless web data – digital «noise». It visits and navigates around websites from within the user’s browser, leaving your misleading digital footprints wherever it goes. Cool project. However, it has been argued that the organisations that are tracking you can easily filter out the random noise created by Noiszy. With my new iPhone, I can finally install ad blockers. When I tried to find information about the available options, I was struck by the moralism and hypocrisy of many articles on the subject. This subtitle says it all: How to use ad-blockers in iOS 9 (and why you shouldn’t). Sure, the article makes some valid points. One may question Apple’s motives for allowing ad blockers. And certainly, one may question Adblock’s policy to allow «acceptable ads» from companies that pay them a fee (so use an alternative like the open source uBlock Origin instead). But the claim that ad blocking could «kill journalism as we know it» seems a bit over the top. The advertising industry tries to frame ad blocking as an attack on «the little guy», by which they mean small, independent publishers. Their strategy is similar to the Home taping is killing music campaign of the 1980s, by which the music industry tried to make us believe that home taping was bad for musicians. 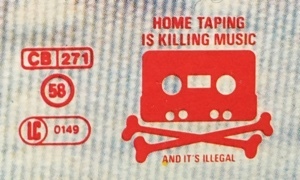 In reality, home taping was killing the profits of the very industry that was exploiting those musicians in the first place. Journalists should be paid for their work, but I’m not convinced advertising is the solution. Ads are annoying, they slow down the internet, they waste valuable surface on mobile screens, they often come with scripts that track you and sometimes they spread malware. Perhaps even more importantly: ideally, journalists shouldn’t depend on advertising in the first place, because advertising is killing independent journalism. So how should journalists get paid? I’m not sure there’s an easy answer. One way is to pay collectively, which may work rather well (BBC), but it does entail some degree of state regulation. Another way is to buy subscriptions from each site or publisher who publish interesting articles - but that’s rather cumbersome. A practical alternative are subscription services like Blendle - described as the «the Netflix or Spotify for journalism» (although it’s more like iTunes in that you pay per article). Blendle is an interesting initiative, but there’s reason for caution. If successful, services like Blendle may well develop into large corporations that try to control access to news stories - much like Spotify tries to control access to music (and Facebook tries to control access to news stories). The outcome could be that subscription services become profitable by exploiting journalists. Also, subscription services could amass an unhealthy degree of control over what we read, and could introduce similar opaque algorithms as the ones Facebook uses to decide what content we get to see. Things might get interesting if journalists would draw inspiration from musicians and set up cooperatives. These could take the form of not-for-profit Blendle alternatives that offer independent quality journalism at a fair price, produced by journalists who are paid a fair wage for their work. For now, ad blockers not only offer practical benefits; they also force the internet to address its unhealthy dependency on advertising.